Here is another real classic from my VHS collection. 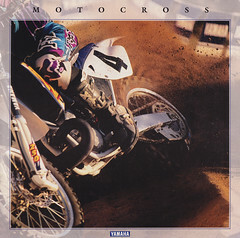 This one is from Atlanta in 1989 and features a real changing of the guard as it marks Rick Johnson’s first loss of 1989 after ripping off five-in-a-row to start the season and Jeff Stanton’s first win on his way to the 1989 Supercross championship. A week after this race, Danny Storbeck would land on Johnson in practice at Gatorback, breaking his wrist and effectively ending the RJ era.